Your J-Card…now on your phone! 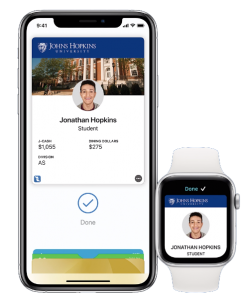 With the new J-Card Mobile Credential, Homewood students can use their iPhone, Apple Watch, or Android device to get into their residence hall, print documents at the library, pay for lunch, or shop at the book store. Available to all full-time enrolled Homewood undergraduate and graduate students as well as Homewood faculty and staff. With support for iPhones, Apple Watches, and Android devices, your J-Card is always with you. Works any place on or near the Homewood campus where plastic J-Cards are accepted—including local businesses. It’s easy to use—simply hold your supported phone or Apple Watch near the same reader where you would tap/swipe your physical J-Card. There is minimal set up required to use Mobile Credential. Most users will be able to begin using their J-Card on their phone in minutes. Note: If you haven’t done so already, make sure to set up your myIT login code (multi-factor authentication). 4/19/19: Android app updated with bug fixes related to the JHED login process, added support for biometric (fingerprint) login. Users can now use the eAccounts App to make deposits to their J-Cash accounts. See the updated instructions on the Android tab, under Using Mobile Credential on your Android Device. Go to the App Store and download the eAccounts Mobile app to your phone. Swipe through the four introductory screens and tap Get Started. Search for Johns Hopkins University and click through to the JHED login screen. Log in with your JHED credentials. Next, enter your myIT Login Code to authenticate your device. If you haven’t set up myIT Login Code, please see the link above for further instructions. Once you’ve authenticated, you’ll see your J-Card accounts (J-Cash, Dining Dollars and dining plans) along with any related transaction history. Click the Add to Apple Wallet button at the top right to add your J-Card. You can provision credentials for your iPhone and your Apple Watch (one of each per student). Click iPhone and continue through the prompts (Next, Agree to Terms & Conditions). When the process is complete, the app will send a notification to verify your J-Card has been added to the Wallet. Tap Done in the upper right corner to return to the Home screen of the app. You can now add your Apple Watch using the same process. Your device must be powered on, but it does not have to be connected to a network. Some devices (iPhone X models) will still work for a period of time after your battery has been depleted. The J-Card readers are sensitive to the position of your device. Hold the top of your iPhone near a reader to use your J-Card, or your Apple Watch near the reader. For iPhones released after the 6/6 Plus, Express Mode allows you to use your J-Card without unlocking the device with a passcode, Touch ID or Face ID. Just tap your device against the reader to recognize your J-Card. For iPhone 6/6 Plus, you’ll need to double click the Home button, tap your default payment card and select your J-Card. Verify your identity with Touch ID then hold the top of your phone near the reader. To display your J-Card, open Apple Wallet and select your J-Card from your saved cards. To see your J-Card number, select your card in Apple Wallet, click the three dots in the lower right corner and scroll down to the ID number. Contact information for the J-Card Office is also available from the J-Card menu in the Apple Wallet. Have more questions? Check the FAQ below or contact the J-Card Office at jcard@jhu.edu. NFC needs to be available on your phone and active for J-Card Mobile. If you’re not sure if your phone has NFC and if it’s enabled, go to your Settings menu and look for NFC. It may be under Connected Devices> Connection Settings on some phones. (If you can’t find it, use the search option on the top right to double check.) Once you find it, toggle the setting to On. Next, open Google Pay and make sure it’s enabled as well. If you don’t have Google Pay on your phone, you can download it free in the Play Store. If the app prompts you to add a credit card, you can bypass that screen and return to the Google Pay home screen. From there, open the Play Store (again, if you installed Google Pay), search for the eAccounts app from Blackboard and install it. Open eAccounts, click through the start up prompts and tap Get Started. Find Johns Hopkins University and continue to the JHED login screen. Log in with your JHED credentials and enter your myIT Login Code to authenticate your device. If you do not have myIT Login Code, please see the link above for further instructions. Once you’ve successfully authenticated, you’ll see your J-Card accounts (J-Cash, Dining Dollars and dining plans) along with any related transaction history. Click your photo on the upper left corner to add your J-Card to the eAccounts app. You don’t need to unlock your phone, but the screen must be awake to use your J-Card. Tap the power button to wake the screen and hold the middle of the phone near the top of the reader. To display your J-Card, open the eAccounts app and click your photo in the top left corner. To add funds to your accounts in the eAccounts app, save a payment method in J-Card Online first. Make a deposit via your desktop or mobile browser and once you’ve completed the deposit, there will be an option to save your credit card information. Once you have added the card information in J-Card Online, that card will be available in the eAccounts app for future deposits. If you’ve already used eAccounts to access your mobile credential, you’ll need to sign out and back in to update the saved payment information. What are the primary differences in Mobile Credential for Apple/iOS versus Android users? Do I need to turn my phone on, unlock it, or open an app to use mobile credential? No, neither is necessary. The screen must be turned on, but does not have to be unlocked. How do I use my phone at the reader? Place the top of your device near the top of the reader. Place the middle of your device near the top of the reader. Can I make a JCash deposit through the eAccounts app? Yes, using your saved payment method in Apple Pay. No, not at this time. How can I change my JHED password? Instructions can be found on the myJHU website. How do I set up the myIT login code? Instructions can be found on the IT website. Do I still need my physical J-Card? Yes, you should definitely keep your physical card. While your mobile credential is accepted throughout the University, Security checkpoints at the residence halls and other locations on campus may still require you to display the physical card. Can I still use my physical J-Card once I’ve created my mobile credential? Yes, your physical J-Card will remain active even after you’ve added your J-Card to your mobile device. Remember, the mobile credential is a privilege and benefit of being part of the Johns Hopkins community. Anyone found to be misusing their physical card or mobile credential will be subject to the applicable Code of Conduct or HR policies regarding fraud and/or misconduct. Why can’t I double-tap the side button with my phone locked to see my balances in Apple Pay? When using Express Mode (iPhone 7 and later), your J-Card will not be displayed with your other cards for security reasons. Can I use Mobile Credential if my phone’s battery is dead? If you have any of the iPhone X models, yes: Express Mode with power reserve is available for up to five hours. Android phones and other iPhone models (iPhone 8 and earlier) do not offer this feature. How do I access my J-Card in Wallet on an iPhone 6 or 6 Plus? Double-click the Home button, then tap your default payment card and select your student ID. Rest your finger on Touch ID to authenticate and hold the top of the device near the top of the reader. How do I check my iPhone device version? On your device, go to Settings> General> Software Update. If your device is running iOS 12.2, great! If not, tap Download> Install. You may need to enter your passcode to start the update. Once the download is complete, follow the instructions on your phone to finish upgrading to iOS 12.2. How do I check my Apple Watch device and/or software version? Follow these instructions from Apple to find which version of the Apple Watch you have. Please note, the series 0 Watch is not compatible with Mobile Credential. Find your Apple Watch device version and/or software version. How do I enable Wrist Detection on the Apple Watch? On your paired iPhone, open the MyWatch app, tap Passcode and make sure Wrist Detection is enabled. I have questions about my Apple ID or iCloud? Please see the Apple ID and iCloud FAQs on the Apple website. I already have the eAccounts app installed. Do I need to update? Yes, you will need to update the eAccounts app to utilize Mobile Credential. How do I update the eAccounts mobile app? On your device, visit the App Store or Google Play and search eAccounts. The store will prompt you to install any required updates. How many Apple devices can I add? You can have one iPhone and one Apple Watch on your account at a time. See the ‘Securing My Account’ section below if you’ve lost a device and need to deactivate your credential. Do I need to reactivate my devices each term? No. As long as your Johns Hopkins enrollment meets our eligibility requirements, devices you have enrolled will remain current. For security purposes, we may deactivate devices that haven’t been used for an extended period. You can re-enroll those devices whenever you wish. What if I’m away from campus for the semester and don’t want my J-Card on my device? Can I delete and re-add it later? To remove your iPhone credential, navigate to the Wallet app, tap (…) in the lower right corner of your card and select Remove Card. To remove your Apple Watch credential, navigate to the Watch app on your Phone, scroll to the bottom and select Wallet & Apple Pay. Tap on your J-Card, scroll to the bottom and select Remove Card. *To add credentials back onto your device, you must meet eligibility requirements and not have exceeded the device limit for your J-Card. Can I delete my J-Card from my phone or Apple Watch through the eAccounts app? Yes, but we recommend doing this through the app using the instructions in the question above. Open the eAccounts app on your phone, tap ‘Continue to Sign In’ and login with your JHED credentials and myIT login code. Click on your photo in the upper left corner, and when your Campus ID appears, click the icon in the upper right corner. Tap “Add or Remove Campus ID from Wallet” and select the devices you want to remove. Tap “Remove” in the pop-up box and then check your phone. A push notification will take you to the Wallet to finalize the card removal. My account balances are not displayed? If you have available funds that are not displaying, please contact the J-Card Office at 410-516-5121 or email jcard@jhu.edu. We’re available Monday through Friday, 8:30 a.m. to 4:30 p.m.
My balance is different on my device than in eAccounts? Confirm your device isn’t in Airplane Mode or experiencing any other service interruption. Updates cannot be made when there is no connecting service to sync data between eAccounts and your device. The eAccounts app will display the most current information. How do I update information on my J-Card? Name information on the J-Card comes to us from other University systems, and needs to be updated there first. Once changes are completed, the updates will sync to the J-Card on your phone within 48 hours. Students, please contact the Registrar’s Office; faculty and staff should contact their HR representative to request updates. Photos can be updated in the J-Card Office. Please stop by during office hours (Monday through Friday, 8:30a-4:30p) to have a new photo taken. Why do I have a negative balance on my J-Cash / Dining Dollars account? Occasionally, one of our retail devices will go offline. Purchases made during this time will not be removed from your account until the device reconnects to our system. You will see a negative balance if you did not have enough funds remaining in your account to cover the transaction. I used my credit card at a participating retail location when I meant to use my J-Card. What can I do to correct my payment source? Return to the location of the sale and request the store issue a credit card refund, then process the transaction against your J-Card. I am graduating or leaving University employment. What happens to my Mobile Credential? As with your physical J-Card, your Mobile Credential will become inactive when you no longer meet eligibility requirements. If you transfer to another participating program or department at the Homewood Campus, your credential will stay active. Log into the eAccounts app and click the Settings gear in the top right corner. Click on Lost Card on the next screen and choose the mobile device you want to deactivate. You will receive a confirmation email from Blackboard. Any other mobile devices you have added will continue to work as expected. Log into SIS and go to My J-Card under the Personal Info menu. Click on Freeze Card to pick which of your credentials has been lost. Your other devices and card will continue to work as expected. Call the J-Card Office at 410-516-5121 and speak to a representative to report a lost device. Apple devices can also be reported lost via iCloud.com. How do I reactivate my credential if I find my lost device? Log into the eAccounts app and click the Settings gear in the top right corner. Click on Found Card on the next screen and choose the credential you want to reactivate. You will receive a confirmation email from Blackboard and will be able to begin using your device again within a minute. Log into SIS and go to My J-Card under the Personal Info menu. Click on Unfreeze Card and select the credential you reported lost to reactivate it. Visit the J-Card Office at 410.516.5121 and request one of our representatives reactivate the credential. Credentials can also be reactivated via iCloud.com. I suspect there has been fraudulent use of my credential. What do I do? Deactivate your card or Mobile Credential immediately (see What should I do if I lose my device?). Identify the fraudulent activity: For purchases using J-Cash, Dining Dollars or meal swipes, contact the business and report the suspected fraud. If door access was involved, notify JHU Security at 410-516-4600. Contact the J-Card Office as soon as possible to obtain a replacement credential. We’re available Monday through Friday, 8:30 a.m. to 4:30 p.m.
Where can I use my Mobile Credential? Your Mobile Credential will work at any door on campus with iPhones and Android devices, provided you’ve been granted access to that door. You can also make purchases with J-Cash, dining dollars or your meal plan at any location where you would usually use your J-Card. Mobile deposits to your J-Cash account may only be made using iPhones/Apple Wallet at this time. According to this, my card should work at X location. What’s going on?